This spotless and spacious 2,600 sq ft home with a heated pool and private tennis court provides the ultimate in indoor-outdoor living. Situated on over an acre of land, it is ideal for two families or an extended family. * 6 poolside loungers with a massive adjustable umbrella and plenty of pool toys, noodles, PuddleJumpers, etc. * Cozy den off the kitchen with 42" TV and a small selection of games and toys. Couch opens to a full-size bed for extra sleeping space. * Fully-stocked kitchen with brand new pots, pans, dishes, and small appliances. New gas grill. *Beautifully decorated. All new furnishings and supplies. * All sheets, towels, beach towels provided. Bedrooms 3 and 4 share a full bath (with double sinks) off the hall. One and a half hours by car from NYC. Two minutes to the Speonk stop on the Long Island Rail Road. Five minutes to the Westhampton stop on the Hampton Jitney. Five minutes to Main Street in Westhampton, 10 minutes to Dune Road, 25 minutes to the North Fork. Families strongly preferred. No events, pets or smoking. Maximum occupancy is 10 people at all times. We are a family of four from Brooklyn. We rented vacation homes on Long Island for many years and decided to purchase this one to use ourselves and share with other families. The property is perfect for two families or an extended family. It offers the option of beach or pool, and there's plenty of room for kids to run and play (and be visible from the kitchen/dining/porch area). And of course, there's the private Har-Tru tennis court, along with racquets and tennis balls. New addition: 4 bicycles! Remsenburg is located on the south shore of Eastern Suffolk County approximately 75 miles from mid-town Manhattan. It is a hamlet of about 3 square miles in The Township of Southampton bordered by Eastport and Seatuck Creek on the west and Westhampton and the Speonk River on the east. We stayed at this beautiful home for a family wedding in the area. There were 3 generations and everyone couldn't have been happier. We swam in the pool, played tennis and just relaxed. Such nice hosts nothing was a problem! Thanks for the kind words. So glad to hear everyone enjoyed themselves during the wedding weekend! The house is beautiful-spacious and extremely well maintained. Our large family was very comfortable during our stay. Pool (and tennis courts are fantastic and it is close to beach. Owners very nice and helpful! This house had everything for a perfect family vacation! The rooms are spacious and comfortable. The home is decorated beautifully and the kitchen is stocked with everything you could need. And the yard is just beyond amazing!! The pool is HUGE and the tennis court provided hours of fun! The hosts were great to deal with and responded promptly to all questions. We will be returning soon!!! Everything we needed for a relaxing getaway! The house was clean and comfortable with everything we needed to relax and enjoy ourselves. The owners are really nice and responsive. We had a great stay! Great house for spending g time with friends! This house is beautifully decorated and so comfortable. We loved being in the backyard and lounging by the pool and swimming all day. We all improved our tennis game on the beautiful clay court too! Nearby beach is gorgeous! This house offers it all. 4 really large and comfortable bedrooms. I totally recommend it for family or friends group. The owner is very responsive and helpful. The house provided everything we needed from the kitchen supplies for cooking, to the beach accessories (toys, chairs, umbrella and even a wagon to drag it all in! ), to pool toys, to tennis supplies. Will definitely stay here again in the future. 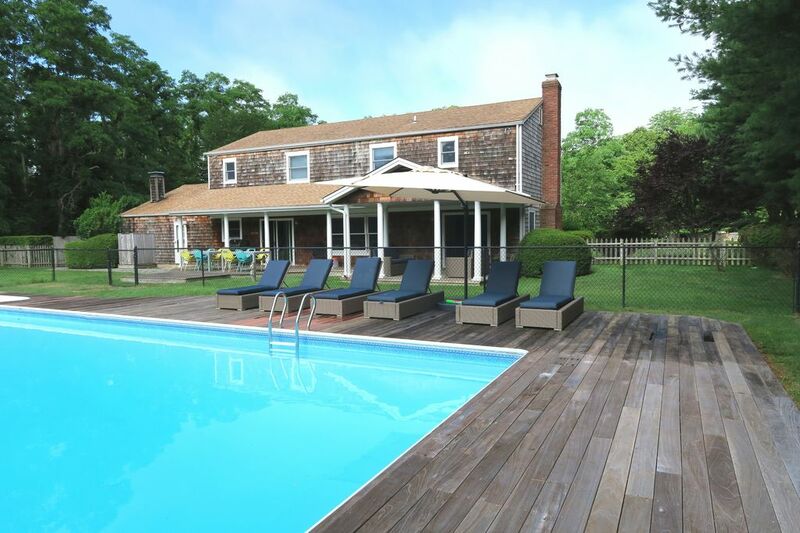 A short drive to the farms and vineyards of the North Fork, Splish Splash water park and Dune road beaches. This is our family home. Please take care of it as if it were your own.